A sophisticated stand for your sophisticated equipment. The On-Stage Stands Mix-400 mixer stand's metal platform can adjust to fit any autolocator, drum machine, or digital audio workstation between 14-1/2" and 21-1/2" long and 12" to 15-1/2" wide. Double-spine gears with radial grooves allow the adjustable head to swivel in any position from fully horizontal to nearly vertical. Use the Mix-400 standing or sitting--the center shaft adjusts the height from 28" to 38" and can be friction-locked into place. 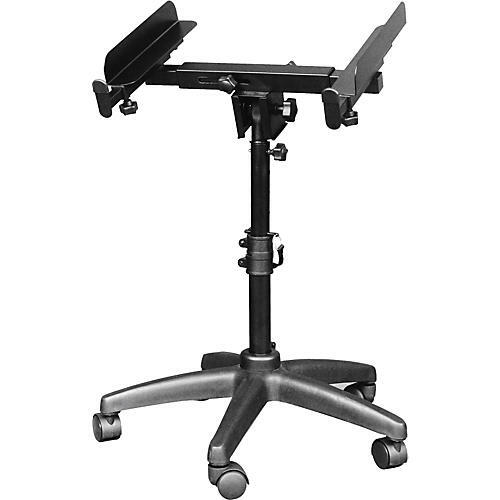 High-impact plastic 5-leg base with fully lockable casters ensures the stand (and your equipment) will stay put. The Mix-400 breaks down into 3 pieces for simple storage and easy portability. Adjustable height from 28" to 38"
Keep your gear secure with the portable, versatile Mix-400 Stand.